George was a Baltimore kid, a long-haired doper hard rockin no-hoper. But he had two things going for him. First, he had an undying love for the Groundhogs. If you like the 'hogs, you'll probably like this, too. His songwriting and guitar chops don't measure up to T.S. and the rest of the boys, but Brigman really means it, so for me they are about a draw. Second, George had a flanger pedal. A properly deployed flanger is like an audio quaalude, taking the rough edges off of any sound. This is about as numbed out as any record you've heard. The sound of this album makes a perfect fit with the cover picture of a burned out urban wasteland. any chance of uploading any michael yonkers? Michael Yonkers? Yeah, I've got a couple of his things. I'll put that one up. It's a used bin staple in the land of SubPop. Please remove this file. It is not yours to share. 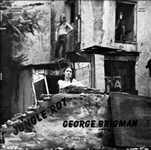 You can show your support of George Brigman by buying his CDs and LPs and blogging about them. We are giving away the "My Cherie" track on myspace.com/georgebrigman. That is the only track you have permission to post. Please respect George's wishes and take this down. Thanks. George's all new Rags in Skull CD will be out early next year.